The superb city of medieval magic is the capital of Switzerland. Home of the many embassies, international organisations, the seat of Federal Government and Federal Congress, Berne also has a definite artistic side. Explore the magnificent museums filled with art treasures; enjoy the famous Berne Symphony Orchestra or visit the cosy, historical basement pubs, Kellerlokale. 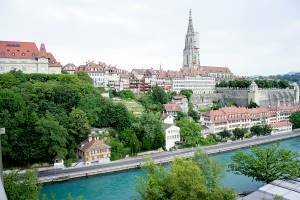 First founded in 1191 and nearly destroyed in its entirety in 1405 when the great fire razed the wooden built town, the city of Berne is today constructed in hardier sandstone and stands as an unchanged paeon of carefully conserved medieval architecture. Berne is in itself a living museum, the craftsmanship of which is emphasised in her artisans like the stone masons who still ply their trade in the open for all to see. Each one of the city's 13 magnificent museums yields an adventure into artistic and cultural endeavour without peer. From the largest Paul Klee collection in the world at the Kunstmuseum to literature through the ages at the Stadtbibliothek to the special experience that is the Symphony Orchestra performing in the superb Gothic cathedral whose 254 steps take the intrepid visitor to the top of the highest church tower in Switzerland, Berne is a magical voyage of discovery. Set within the medieval atmosphere is the largest and most modern sheltered shopping centre in Europe. The 6 kms of arcaded passageways direct the visitor to a network of exclusive boutiques and stores, and the quaint old-town shops. Top off an enchanting day with a visit to one of Berne's historical Kellerlokale or a good cabaret show and dancing.